The mission is not yet accomplished- to have a complete base-map of Lesotho. 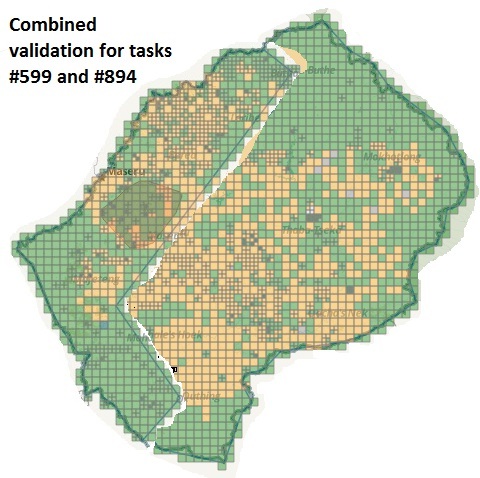 Right now there are two tasks, both are “mapped”, but the larger one (#599) is just at 56% validation, wheras the second rural task (#894) is at 71%. Putting them side by side in one image gives a good idea of what remains. The middle of the country requires lots of work. Quthing and Mohale’s Hoek share a large swathe of yet to be validated mapping. More people should be introduced to Open source mapping skills, be encouraged to map and find reason why they should map. The training and engagement team on #MapLesotho still have a big role to play. In one of its main tasks is to recruit as many people as possible into mapping to complete the three tasks in Lesotho. Of course there is a group who have a particular reason to want to map using OSM, and that too before all this work is done. These are the Land Surveying Division of the Ministry for Local Government and Chieftainship. On the 19th of February our Minister announced that the Land Surveying division would take the statutory mapping function off the Land Administration Authority. And with the #MapLesotho data now so voluminous for buildings she was going to enable planners to carry out formal “settlement planning”. Whatever we use this data for The LS division now has charge of mapping services, and will use #MapLesotho, among other things to provide the data required to various agencies. Luckily we had given seven staff from the division training during our own two weeks of #MapLesotho in February. As a way of achieving this, the training and engagement team held an introductory training at Maseru Land use planning offices with the land surveyors and helped them sign up on OSM. Introduction about what OSM is was made and surveyors were made aware of the importance of mapping Lesotho. The training itself had a number of “lessons learned”. We have to do more to arrange rooms in a manner to facilitate trainers. We have to ensure there is good wifi, even if it means plugging in the BRCK. And we have to have control of the venue, to prevent interuptions. Having said that we will be back soon, demonstrating JOSM and getting the LS division on board for the remaining push to complete #MapLesotho base map.